Fundraising Events :: Headway of WNY, Inc.
Thursday, May 16, 2019, from 6 - 9 p.m.
Headway of WNY, an affiliate of People Inc., is excited to host its 20th Annual Spring Gala, “The Roaring Twenties,” on Thursday, May 16! The event, which has become a favorite for many, will be held once again at The Atrium @ Rich’s in Buffalo. Be prepared for a fun time – get out your top hats and fedoras or dress like a flapper, gangster, silent screen star or dress as you are! The 1920s-themed event will feature live music by the Bobby Militello Quartet, basket raffle, silent auction, food stations, two hour open bar and much more! New this year is the opportunity to purchase admissions online! Sponsorship opportunities are now available and auctions items are needed. Event proceeds benefit Headway of WNY to ensure that people in Western New York with brain injuries and other disabilities have access to advocacy, resources and support systems to enable them to live as independently as possible. Pre-sale admission prices end at midnight on Tuesday, May 14. For more information, to become a sponsor, donate items or if you have questions about event admissions, contact Christine Melchiorre at cmelchiorre@people-inc.org or call 716.408.3117. A variety of sponsorship levels are available. Silent auction items and basket raffle donations are welcome. Sponsorships and admissions to event may be purchased online here. Pre-sale prices end at midnight on Tuesday, May 14. 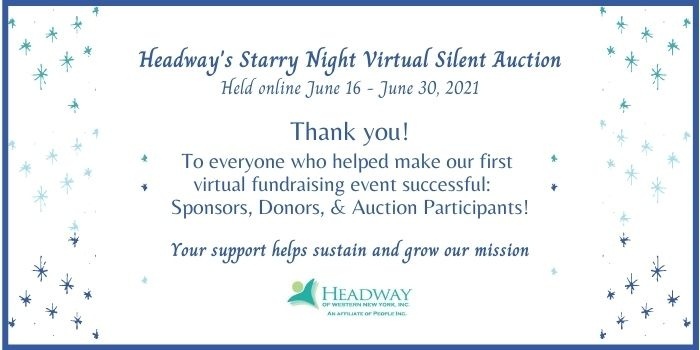 Thank you for your support and we look forward to seeing you on May 16! Thank you to all who helped make the 2018 Carnevale spring gala a great success! All proceeds from the annual spring gala benefit Headway of WNY, Inc., an affiliate of People Inc.
Headway's Spring Gala is held each year during the month of May and is our main fundraiser. This was a family friendly fundraising event designed to raise awareness about traumatic brain injury (TBI), encourage helmet use, safety and brain injury prevention. Thank you to all who joined us for an evening walk or bicycle ride around Ring Road in Delaware Park featuring helmets and costumes. The event began at Parkside Lodge and ended there with a Halloween themed reception complete with food/drink, music, games, prizes and raffles. Participants were encouraged to wear stylish helmets or dress up helmets in coordination with their costumes. We're so grateful for your support! And to all other organizations, groups and individuals that donated gifts-in-kind, purchased tickets, or contributed in a variety of other ways to make this year's event a great success. Thank you for your generous support of our Mission!